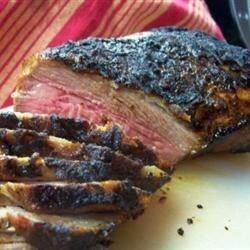 "This grilled tri-tip recipe tastes gourmet, but is actually very easy to make. It's a perfect dinner for guests. It is sure to impress!" Using a sharp knife, cut small slits into the top of the roast. Stuff the slits with slices of garlic. Mix together salt, pepper, and garlic salt. Rub entire mixture all over the tri-tip. Refrigerate at least an hour and up to all day. Take the meat out of the refrigerator about 20 minutes before grilling. Place the meat directly above the flame for 5 to 10 minutes per side (depending on thickness) to sear the meat and lock in the juices. Turn the grill down to medium heat and continue to cook for another 25 to 30 minutes, trying not to flip it too much. Check for doneness with a meat thermometer. Thermometer should read at least 145 degrees F (63 degrees C) for medium-rare. Let stand, covered loosely with aluminum foil, for 5 minutes before slicing. Tri-tip steak hits the grill with a rave-worthy spices-and-herb rub. *Tri-tip is not a common cut around here, so I usually call the butcher at my local grocery store and request it the day before I need to prepare it. I would have given it 5 stars but TOO MUCH SALT. Two Tbs. salt is plenty for this rub and use garlic powder not garlic salt, no need to salt it twice. Great recipe, but searing does not "lock in juices". You actually lose juice, but you gain flavour from the browning of the meat, caused by high heat and protein. My husband and I really liked this. But it is a bit salty. I would cut down the salt next time. We will make again. TOO SALTY...maybe if substituted garlic powder for the garlic salt?